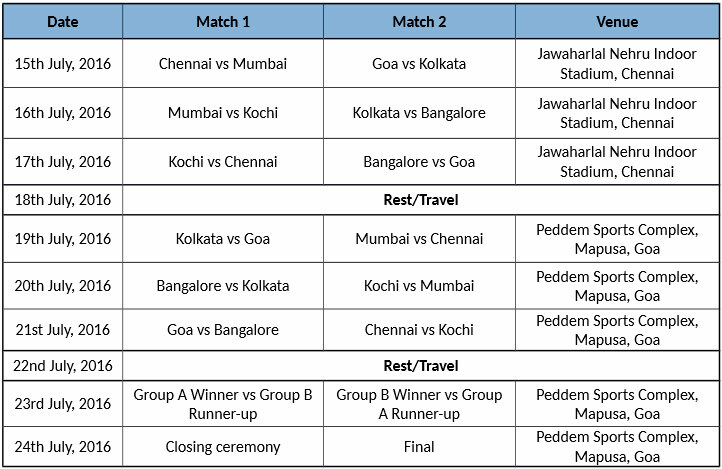 Premier Futsal, world’s first multi-national Futsal tournament, will kick-start their inaugural edition at the Jawaharlal Nehru Indoor Stadium in Chennai on July 15. The first edition of the league will see six franchises divided in two groups to battle it out over eight matchdays and 13 matches to make it to the finals which will be played in Goa on July 24, 2016. The unveiling of Manchester United Ambassador Ryan Giggs, Ronaldinho the smiling assassin from Brazil and the Argentine forward Hernan Crespo completed the signing of their six marquee players. Premier Futsal has previously announced Manchester United’s former midfield maestro Paul Scholes and Galactico Míchel Salgado as their other signings. With Portuguese international Deco having to drop out last minute because of injury, the “Pele of Futsal”, Falcao will replace him as the sixth marquee player for the league. Premier Futsal also introduced all its franchise owners for the first edition today. The Mumbai franchise has been picked up by the renowned car designer Dilip Chhabria, where as the Goa and Kochi franchises have been bought by Viiking Ventures Pvt. Ltd. and Dubai based Yes Events Management respectively. Premier Futsal recently announced Kannada film star Puneeth Rajkumar as the owner of the Bengaluru 5’s franchise. The Kolkata franchise was bought by Bengali superstar Jeet, while Janani Ramesh of the Hindu Group, was the first to pick a team in its debut season. The teams for each of the franchises were also announced today. The teams have been picked by an independent committee comprising of International Futsal experts with a view to make the teams balanced and the league competitive. For the next season, all the Futsallers will go back in to the bidding pool and the owners will have to pick their team through a bidding process. The marquee players which have allotted will remain with the six franchises for the next season as well. Premier Futsal also concluded ‘Launchpad’, a talent hunt program which was conducted in eight cities to scout for Indian Futsal players. The shortlisted Indian Futsallers were hosted a boot camp in Chennai and five players from each of the franchise markets were announced today. Each of these five players have been drawn in to the teams of their respective cities and will get a chance to play alongside the current best Futsal players in the world and the marquee football players. Premier Futsal is a private and semi-professional Futsal league that will be hosted from July 15 – 26 to create awareness of futsal as a sport in India. Premier Futsal is backed by Mr. Xavier Britto of the Indev Group. The league will kick-off 15 July 2016, and will be telecast live and exclusive on Sony SIX, SONY ESPN and Sony AATH. Matches will also be available to live stream on SonyLIV.